A former IDF medical officer and a Palestinian from a refugee camp are seeing the conflict in a whole new way this summer. WASHINGTON -- When Waleed Issa walked into the Americans for Peace Now (APN) Washington, DC office on the first day of his summer internship in June, the 25-year-old Palestinian from the Dheisheh refugee camp south of Bethlehem was startled by what he saw. Continue reading The Times of Israel: Jewish, Palestinian American groups 'swap' summer interns. 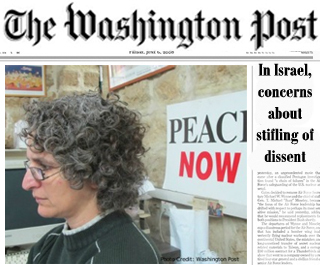 The Washington Post's Sunday edition featured Hagit Ofran, the director of Peace Now's Settlements Watch project, in a story about the attacks on Israel's democracy and civil society. In the face of repeated death threats, she is not intimidated and determined to continue her work, educating the Israeli public about the threat that West Bank settlements pose to Israel's future, Hagit told the Post. Shortly after the article was published, Hagit and six of her colleagues at Peace Now again received death threats yesterday, this time by email. Continue reading Washington Post profiles Hagit Ofran: not intimidated by death threats. While Israelis and their friends abroad are preparing commemorative events to mark the fifteenth anniversary of Prime Minister Yitzhak Rabin's 1995 assassination, the settlers' chief news site, Arutz Sheva (Channel 7) has come up with its own way of commemorating Rabin. The right wing site is launching a bizarre contest of conspiracy theories regarding the assassination. Readers are urged to send in their wildest theories about who is responsible for Rabin's murder. Arutz Sheva promises to publish the "most interesting" theories. Continue reading Wanted: Conspiracy Theories. Last night, extremists further escalated the settlers' campaign to terrorize Palestinians and deter Israel's law enforcement authorities from protecting the rule of law in the West Bank. After desecrating and vandalizing mosques in the West Bank, these hooligans are now attacking loyal Israeli Muslim citizens. Continue reading "Price Tag" Crosses the Green Line . A day after another West Bank mosque went up in flames again, Israeli Television (Channel One) today reported that law enforcement authorities have zeroed in on the settlers who torched another mosque, in the West Bank village of Yasouf, in December 2009. According to the report, the Shin-Bet and the Police know who the terrorists are, but they have not been arrested yet because of intelligence considerations - whatever that means. Continue reading Another West Bank Mosque Burned. Ynet (VIDEO): "Sheikh Jarrah Jews praise Baruch Goldstein on Purim"
Continue reading Ynet (VIDEO): "Sheikh Jarrah Jews praise Baruch Goldstein on Purim".